A rectangular porcelain plaque finely enamelled in delicate hues with a landscape scene. A small boat in the middle of a wavy river carries two literati and a boatman, who is paddling towards the riverbank amongst the mountains. A man accompanied by two attendants stands on the riverbank, whilst a porter carries their luggage and walks toward them. The rugged mountains are adorned with leafy trees on the cliffs, and a narrow footpath meanders towards the top of the mountain, where a group of pagodas is located. Some literati are visible through the studio windows. Overlapping ranges of mountains occupy the right side of the plaque in dark grey and light brownish colour, whilst some light greyish mountains lie horizontally at the far end. This finely painted plaque perfectly represents traditional Chinese ink landscape painting on porcelain, rather than on a piece of paper. From the mid Qing dynasty onwards the development of porcelain painting prospered. Porcelain artists were committed to transplant Chinese ink painting from paper to porcelain works, including porcelain plaques, screens, brush pots and paperweights. During the late Qing dynasty and the Republic of China period many porcelain painters gathered in Jingdezhen, Jiangxi province. It was not until 1928 that the eight most famous porcelain painters formed the Yue Yuan Hui (The Club of Circular Moon), later known to the collectors as the ‘Eight Friends of Zhushan’. The eight porcelain artists, following the traditional painting style of the ‘Eight Eccentrics of Yangzhou (Yangzhou baguai)’ of the mid Qing dynasty, made porcelain painting become a mainstream of art. 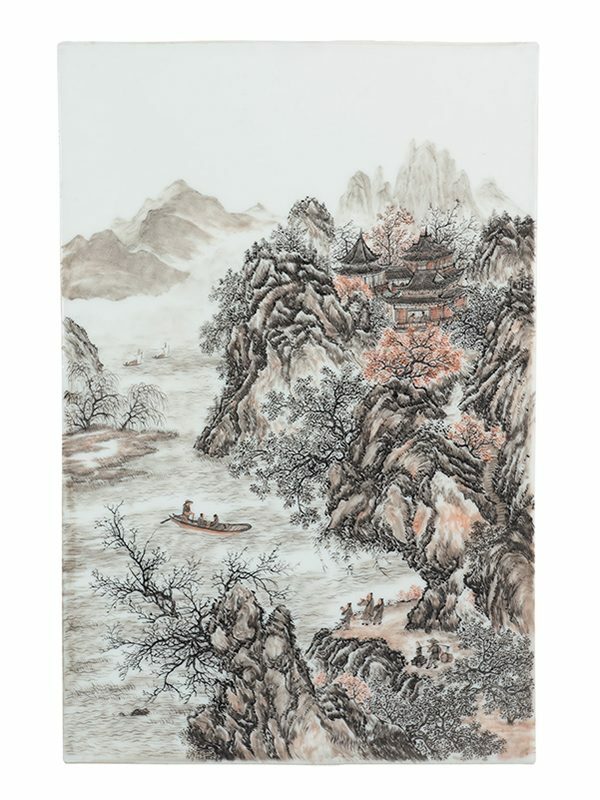 This porcelain plaque depicts traditional Chinese landscape painting, Shan shui, literally ‘mountain-water’, referring to a style that depicts scenery or natural landscapes. These landscape paintings usually centre on mountains, which had long been seen as sacred places in Chinese culture. Three comparable porcelain plaques are illustrated in Pian Xie Shan Fang Cang Ci (Porcelain Collection in the Pian Xie Retreat). These eight porcelain artists include Wang Qi, Wang Dafan, Wong Yeting, Zhen Bishan, Bi Botao, He Xuren, Chen Yiting, Liu Yuchen.